Specsavers disposable foam earplugs effectively reduce levels of unwanted noise. Specsavers disposable foam earplugs should be fitted in accordance with the instructions and diagrams shown below. Always wash and dry your hands before fitting. 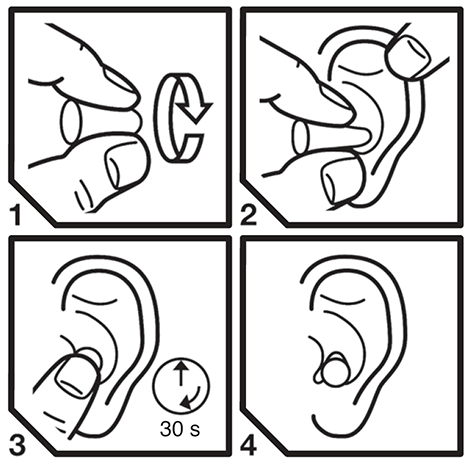 The earplugs should be fitted, adjusted and maintained in accordance with these instructions. Improper fitting will reduce effectiveness and could result in hearing loss or injury. Earplugs should be worn at all times in noisy surroundings; it is critical to wear earplugs in any environment where the noise levels exceed 85dB. Use the earplug whole. Do not cut or break apart. Regularly inspect the earplugs for dirt or damage. Suitable for adults and children over the age of 3. Adult supervision required for children. Reach over head with free hand, pull the ear up and insert the earplug inside ear canal. Hold earplug in place for approximately 30 seconds so that it expands to shape inside the ear canal. To remove the earplug, gradually break the seal by slowly twisting the earplug. Rapid removal may damage the eardrum.